About halfway through the brilliant One Flew Over the Cuckoo’s Nest, director Milos Foreman presents us with an image whose delicate paradox underlines the dichotomies of themes that govern the film. In a still, lengthy, almost monochrome closeup, a squirrel daringly but carefully walks across a chain link fence. In this one moment the ideas behind the movie and its source material, Ken Kesey’s novel of the same name, crystallize: nature against the machine, freedom versus imprisonment, inside and outside. The small animal stops on the fence and looks towards the other side. Like McMurphy, it sticks out because of its incongruity and, also like the main character, is too small a force, no matter how powerful, to leave its mark on the establishment. Cuckoo’s Nest, both film and book, captures McMurphy’s struggle against authority, the heartrending victories of a classic outsider, a free spirit in a closed system, and his eventual, tragic descent. But while the novel is a celebration of how one man, making a near-spiritual sacrifice, can make a difference, awakening from their drugged lethargy an entire community of the defeated, the movie presents us with his ultimate failure. Judging the film as a separate entity from the novel, it is an emotionally compelling masterpiece, but, after having read the source material, it’s clear a lot is lost in translation from page to screen. ***This is a comparative analysis of Foreman's film and Kesey's novel, and it contains spoilers. The first shots after the opening credits capture the deadening atmosphere of the hospital where the characters spend their passive, indifferent existence. There is no music on the soundtrack, no color in the cinematography, no life, just the automatic, artificial good mornings the nurse extends and the monotonous, rhythmic sounds of footsteps and rattle of pills. The patients, their white clothes reflecting the blankness of their minds, queue up in neat little lines for their medication. They blend into the whiteness and blandness of their surroundings like nonpersons, cogs in a dehumanized, nameless, faceless machine. The orderlies and nurses are not any better, their white uniforms stiffly starched to perfection. Enter R.P. McMurphy, a loud, irreverent, fast-talking, life-loving rebel in the outlaw attire of jeans and a starkly contrasting black leather motorcycle jacket, and we know things are going to get shaken up a little. Dancing his way out of handcuffs and into every patient’s reticent good graces, McMurphy becomes their hero, their savior, and their martyr, bucking the system and refusing to surrender himself to it. Over the next few weeks, the character evolves into a larger-than-life presence, “the logger (…), the brawling Irishman, the cowboy out of the TV set walking down the middle of the street to meet a dare”; he is exceptional for no other reason than being what he is, his own self, his own man, uninfluenced and unshaped by the forces of the Combine (pg. 171). In the novel, he teaches the other patients how to be themselves as well, how to reclaim their manhood and their humanity from under the domineering power of Nurse Ratched, a woman who has subsumed sexuality and humanity into duty and righteousness, who has taken every characteristic of identity and individuality and twisted it into a grotesquely warped vision of conformity and machine-like efficiency. As seen through the Chief’s eyes, Kesey’s prose surges, ebbs, and flows in an unforgettable, distinctive voice full of lyricism and feeling. The film, told from an objective, third-person perspective distances us from the characters. They come wondrously alive under Foreman’s direction, each superbly cast, but each a bit less than fully-formed individuals, closer to the categories, types, and labels of the hospital. Their insanity, more than their humanity, is evident in every scene, and the marvelous chaos that ensues regularly throughout the film is refreshingly uncontained. 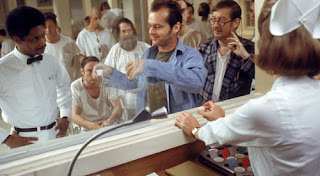 Of course, because of time limitations, many of the events of the novel are left out or compounded, giving the film a more frenzied, frantic feel as one incident gives way to the next and the men start coming out of McMurphy’s shadow and finally casting their own by realizing they have unexplored depths of stature and weight and meaning, even control over their own minds, bodies, and fates. Beholding McMurphy work his magic is a pleasure and a privilege, and seeing Nicholson wheel and deal—both metaphorically quite literally —is one advantage Foreman’s Cuckoo holds firmly over Kesey’s. He laughs, he screams, he wise-cracks and sings, and through charisma, gall, and sheer will power stages something of a revolution, a reclaiming of rights for the patients. Even their outfits change from white to a lively, natural green. McMurphy convinces the men they can be men again, even if they’re just staring at their reflections in a blank screen when the World Series is on. 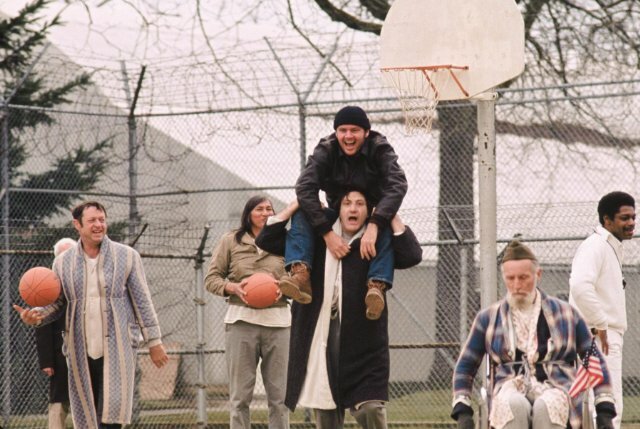 The sport they do engage in, basketball—in scenes added to Kesey’s writing by the script—is a manifestation of a corporal ideal of masculinity in physical fitness, strength, and ruggedness which reverses the weakening of masculine traits under the matriarchal dominance of the ward. Basketball allows them to be aggressive, self-reliant, and disciplined on their own terms, and, winning with Chief’s invaluable help over the orderlies, they reassert their power and presence. What makes them men is not getting drunk and getting laid, as in the party scene, but the ability to do so, to let loose and laugh and enjoy themselves in a spirit of tightly-knit camaraderie. The fishing trip, a key turning point in both works, is, however, less effective in the film. In the novel, the patients use their condition as a source of power for the first time and are delighted by the result when the gas station attendees succumb. In the film they are not allowed to be themselves, instead pretending they are doctors from the hospital. 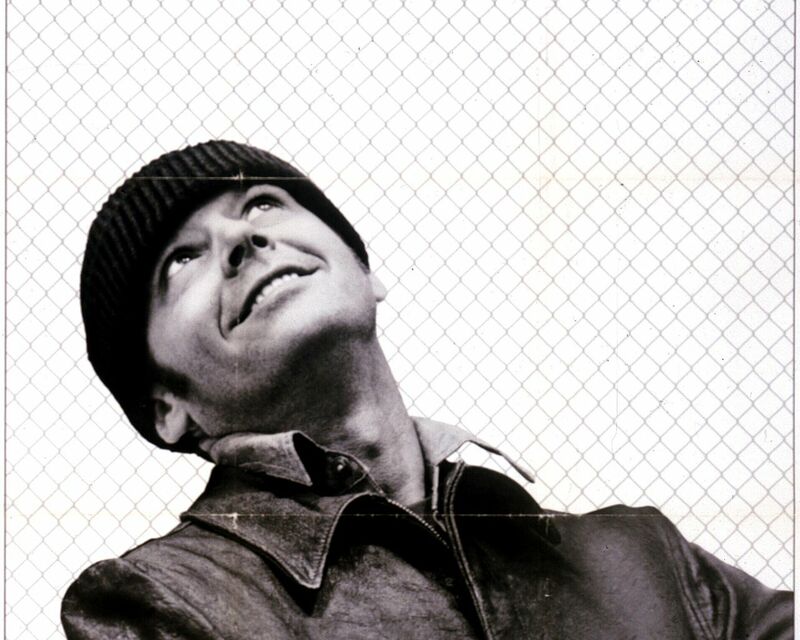 The scene in which McMurphy introduces them as such to the dock worker—all but poor Harding, who remains “Mr.”—and a series of closeups comically plays off their unprofessional appearance represents a moment of pure joy and relief in a film that uses humor to underscore poignant, painful truths. However effective scenes like these are on their own terms, they lose some of the meaning behind Kesey’s work. Other important scenes also seem less meaningful in the movie. When McMurphy offers the Chief some chewing gum and he thanks him, the first word he has spoken to anyone in years, it’s wonderful to see Nicholson’s face and laugh with the Chief at the simplicity and quiet grace of the moment. But reading the book we better understand the interaction is more than a funny surprise—and it is a surprise to the viewers when he talks in a way it cannot be to the readers. In Kesey’s novel, the Chief is not thanking McMurphy for the gum, but expressing an uncontrollable need to show gratitude for everything else he’s done for the men. At the same time, however, there are scenes of haunting beauty and poetry that Foreman and writers Lawrence Hauben and Bo Goldman come up with for the film, like the extended closeup of McMurphy’s face before that last fateful morning. The camera lingers on his ambiguous, obscure expression; lost in thought, a small smile creeps up on his lips, but it seems more sad than joyful. What is he thinking? Does he decide to stay and forego his escape? Is he giving up or manning up for another round with Ratched? We don’t know if he’s hopeful or resigned. Perhaps the movie audience’s biggest loss is not getting to know the Chief’s story; his importance in the book makes his final liberating act more forceful. 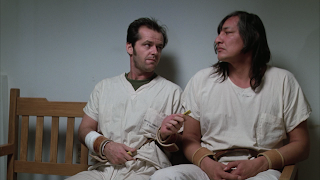 In the film no other patients see McMurphy after the operation, whereas in the novel they tell themselves it’s not actually him. When the Chief takes his life—what’s left of it—it is shocking in both movie and book, but it is more understandable in Kesey’s novel. After his escape, the two works diverge in the last scene of the film enough to create opposite meanings. In the book McMurphy’s sacrifice is not in vain: one by one the men sign out of the ward, breaking free of Ratched’s control, which has been decimated in one fell swoop when McMurphy attacked her, ripping her clothes off in the process, asserting his physical, sexual power over her and making it impossible for her to hide her humanity, vulnerability, and femininity behind the mask of a starched uniform. 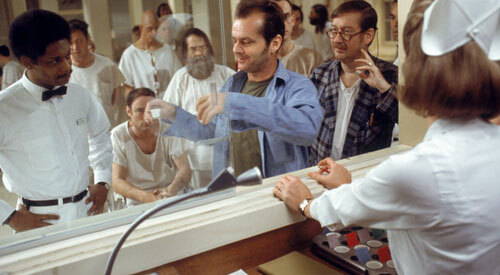 In the film everything goes back to the way it was before, as if McMurphy had not existed at all. Even before he is brought back down from Disturbed the ward looks like it did in the first scene. Harding deals blackjack as the incessant, lifeless music plays on and on, and the men line up for their medication, which Nurse Ratched, all patched up and better, administers through an opening in her spick and span new glass window. So whereas Kesey’s hero succeeds, leading the patients on to better lives, his sacrifice is inconsequential in the movie. I read through your article almost immediately after seeing the film. Very well written, you explained the meaning behind both versions, allowing me to take a better understanding away from it. I am now looking forward to reading the book, thank you! I disagree that the ending is not optimistic. At the end of the movie, we see that even in McMurphy's absence, his spirit lives on in the hearts of the patients. They still gamble, and make legends about him. McMurphy, knowing the extent of the cruelty Ratched will show you, should you not follow her orders, still strangles her. He knew he would be tortured by the staff for that, and does it anyway. And I disagree, that McMurphy gave up hope. He smile and free spirit lasts throughout the movie. The electric shocks only "charged" him up as McMurphy says. No amount of electric shocks in the world would bring him down.